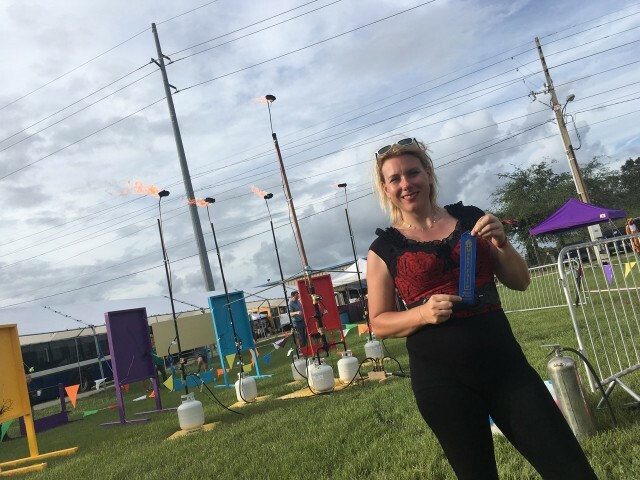 As mentioned in my previous post, I got to help out at Maker Faire Orlando and while I spent most of the Faire working, I did get a chance to check out some of the makers and exhibits that were there. Here’s my report! 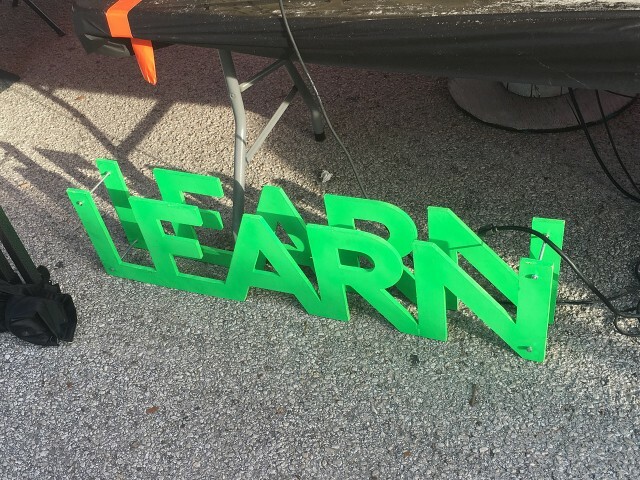 I really liked these CNC’d words offset with some nuts and bolts to make a simple 3D piece. I can see making some of these on the large CNC we have in our shop. 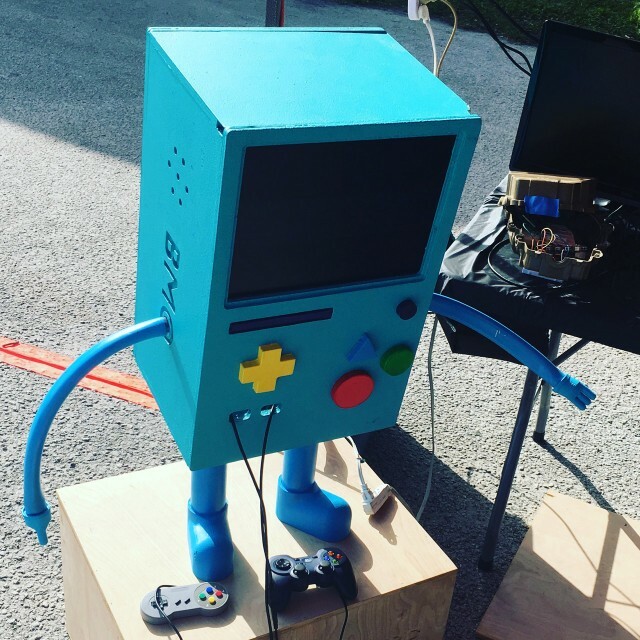 This cute lil BMO from Adventure Time housed a video game system. 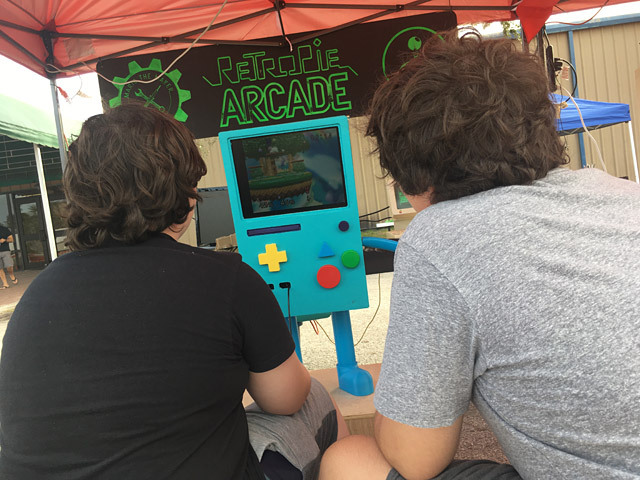 I didn’t get a look inside, but I’m guessing it might have been a Raspberry Pi-based RetroPie. My favorite piece from the Miami Makers was this super-simple demo that served as a visualization of sound waves. It was a pan of water on top of a cabinet with a speaker below that played sounds. Here’s a short video showing how it worked. Jeremy S. Cook was there with his ClearWalker. I’ve been a fan of Jeremy’s posts for quite a while, and if you haven’t see his YouTube channel, check it out! One of the things I love about Maker Faires is being able to meet makers I’ve known online for years. 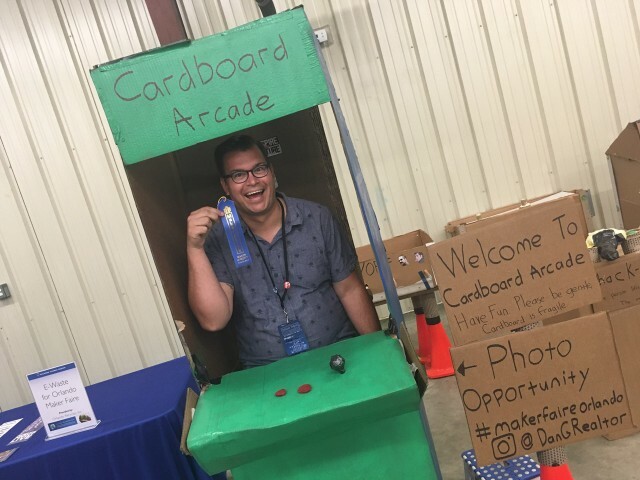 I came across this Cardboard Arcade while I was putting up all the signage for the Faire, and I wanted to come back and meet the maker who made it. For some reason I assumed some young maker(s) were behind it, but it turned out to be a maker called “DanBot 5k1″. 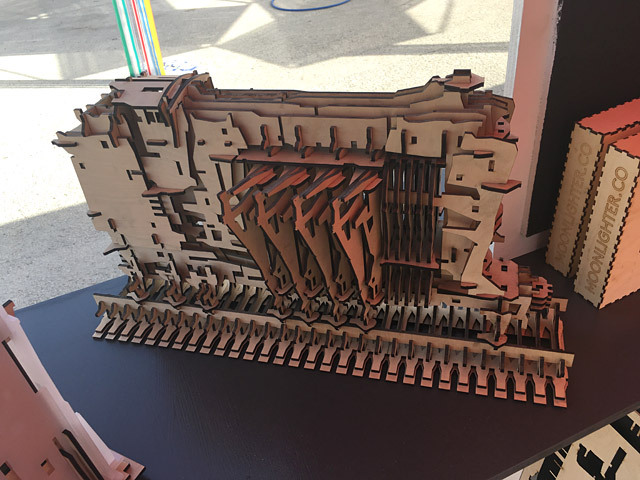 He told me he loves building things with cardboard, and that as kids were checking it out they’d get excited because they realized they too could build things with cardboard. It’s pretty much free, and all you need is some tape, glue, some markers, and a few other things. Cardboard!!! 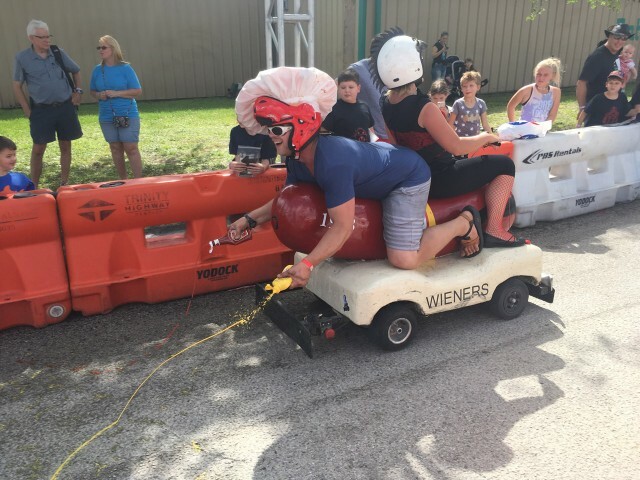 Kathy doesn’t like to do just one thing, so she also brought the Wienermobile down to Orlando for the final race of the season for the Power Racing Series. (And yes, the Wienermobile brought home the Tesla Cup, as the overall winner of the 2017 season!) Kyle and Kathy make a great (and hilarious) team. We also had a lot of other great teams & cars for the PPPRS race. ACME and Donatello from Michigan/Texas/parts unknown came to have some fun and lay down some laps. 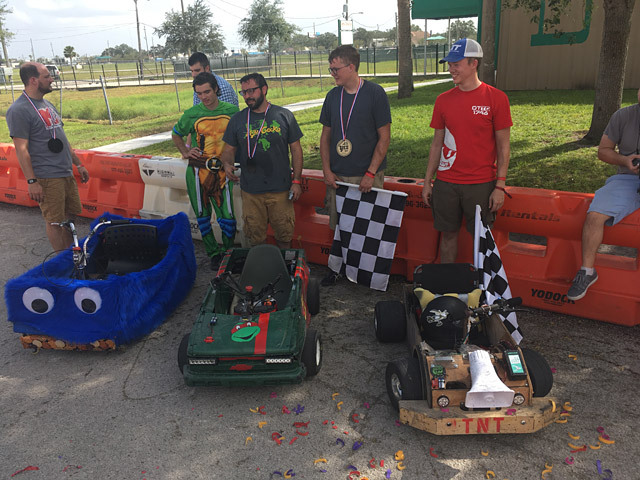 They were joined by Orlando’s (2016 winner) Driftie Monster for podium of the Endurance Race on Sunday. Finally, one of my favorite exhibits was a drawing machine named Botsy. If you know me well, you may know that I’ve got a thing for drawing machines, and I used to design and build them. Botsy is a well designed machine. It’s similar to a concept I had three years ago, but never actually built. That might have been part of my fascination with it, that it’s the realization of something I dreamed about. 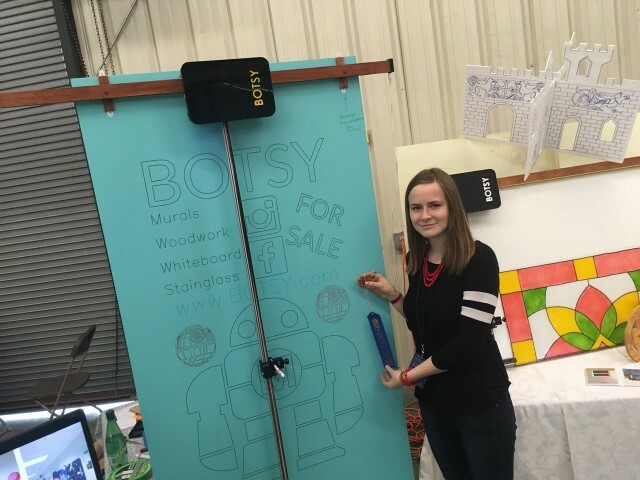 Liza Kholodkova is the maker behind Botsy, and it was great to talk to her about the development. One of the things I really liked about Botsy was that it looked like a finished product, not just a loose collection of wires and wood and an Arduino (which, oddly enough, describes many of my own projects!) Botsy is meant as an aid for mural artists to assist in creating the outline of the artwork fast. It’s definitely faster than any of the string & gondola polarbots I’ve seen in past years. You can check out a few articles about Botsy if you want to find out more. 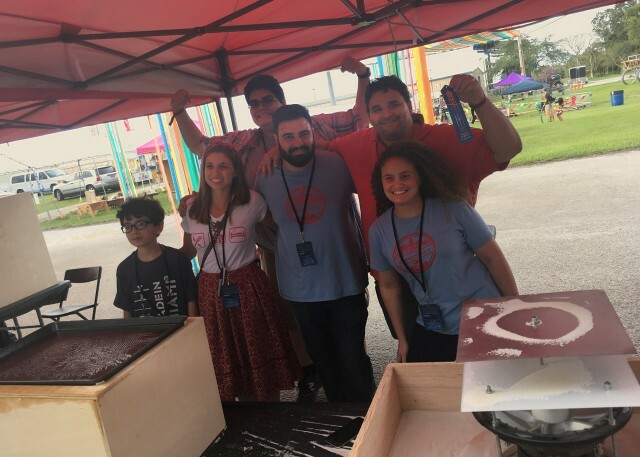 So that’s my recap of Maker Faire Orlando… I hope I can make it back next year and lend a hand in making it happen again. Update: Lots of great photos! 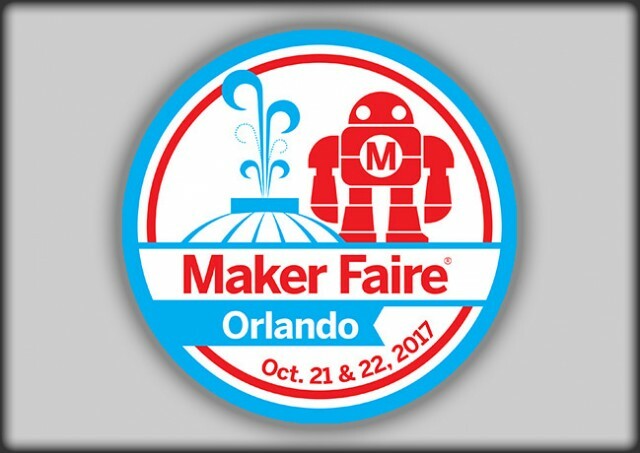 I arrived Wednesday afternoon and headed right to MakerFX Makerspace, which is home to the Maker Effect Foundation, which organizes Maker Faire Orlando. We took care of things there with a plan to hit the fairgrounds Thursday morning. Compared to Milwaukee, it felt like we were a little behind schedule. In Milwaukee our core crew goes on-site Tuesday morning and starts moving things in and getting set up so that we can bring in large exhibits and complex setups on Wednesday. In Orlando we were running just a bit behind, so we spent a good amount of time Thursday chalking the floor grid, dealing with signage, electrical, water, barricades, and other set-up things. More people joined the crew as time went on, and everyone was busy getting things ready. Friday was the day for maker load-in, and I think that’s always a bit hectic no matter what city you’re in. 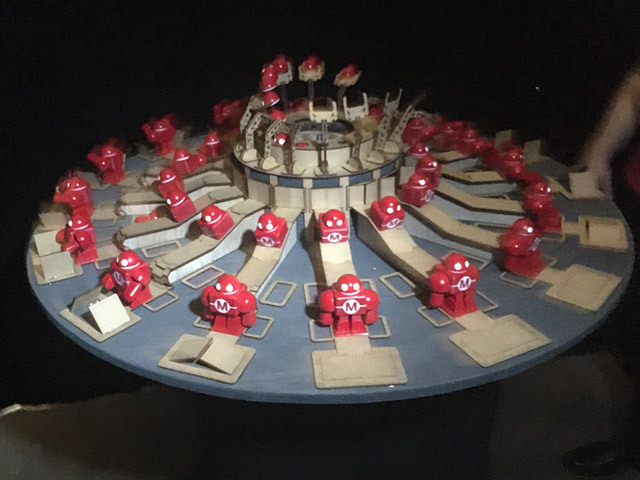 It’s all about getting dozens (or hundreds) of people and exhibits in place as quickly and efficiently as possible. All at once. Does anyone have this process perfected yet? 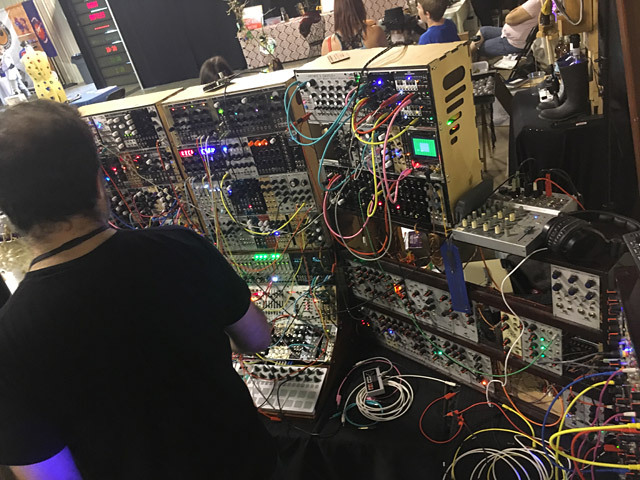 We also had a Maker Mixer Friday night and then some of us managed to get a bit of sleep before the Saturday morning madness began. Again, Orlando is different than Milwaukee. We’re both at a fairgrounds, but Milwaukee is a free event, and Orlando is a paid event. Both of those create a unique set of challenges, but both share many of the same issues. That said, while we had to scramble a number of times, the critical things got resolved quickly. (One of the biggest problems was air conditioning not working properly, or working too well. People were too hot, people were too cold. You can’t please everyone, right?) Orlando had a much larger crew than Milwaukee, and everyone had a radio with an earpiece, which made a huge difference! The best thing about helping out in Orlando was seeing how they do things, and being able to analyze the process in Milwaukee to look for improvements. 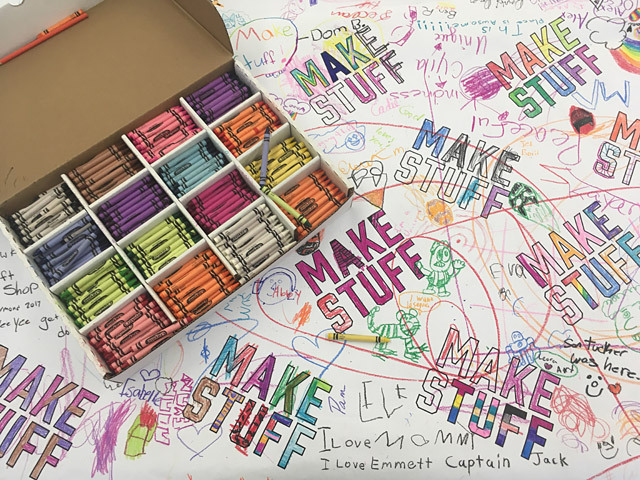 While I was busy making a list of all the things Orlando does really well (often by just quickly snapping a phone photo of something) I also offered advice about how Milwaukee does things, and some of the problems we’ve been able to solve in the past four years. Through all of this, Chad from HackPGH was an MVP (that’s Most Valuable Producer) because he’s been a producer in Pittsburgh, Milwaukee, and Orlando, so he’s seen a lot. 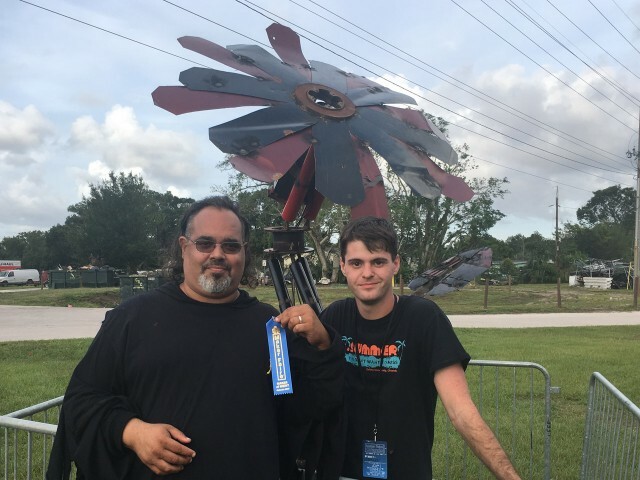 He’s also served on the crew for Bay Area Maker Faire, and the National Maker Faire. 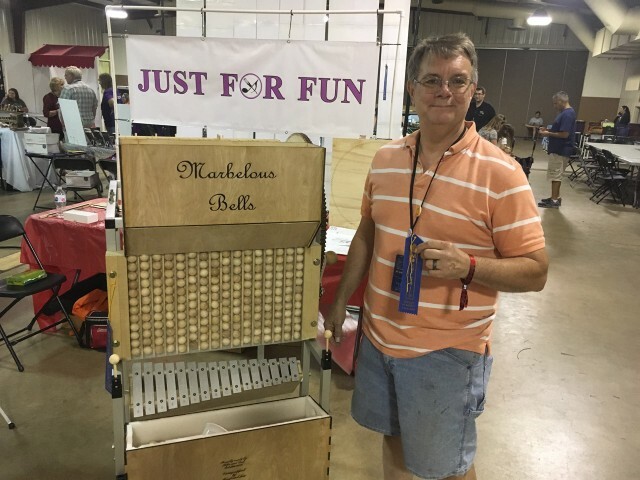 I see Chad as a conduit between Maker Faires, and able to share best practices between them. 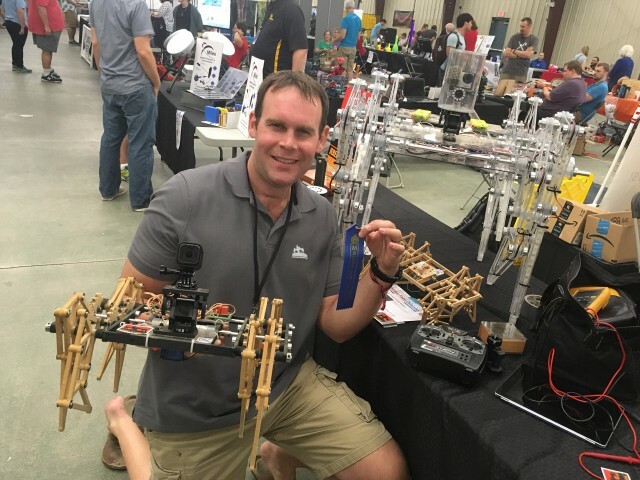 So yeah, I’ve now helped produce a Maker Faire that wasn’t in Milwaukee, or even in Wisconsin, or even in the Midwest. It was in Florida, where it’s hot and humid and they have “fire ants” and no cold water from the tap. It was awesome and amazing and different… and I loved it. Oh, I diverted from where I thought this post was going, so I’ll be following up with a look at some of the exhibits and projects I saw.